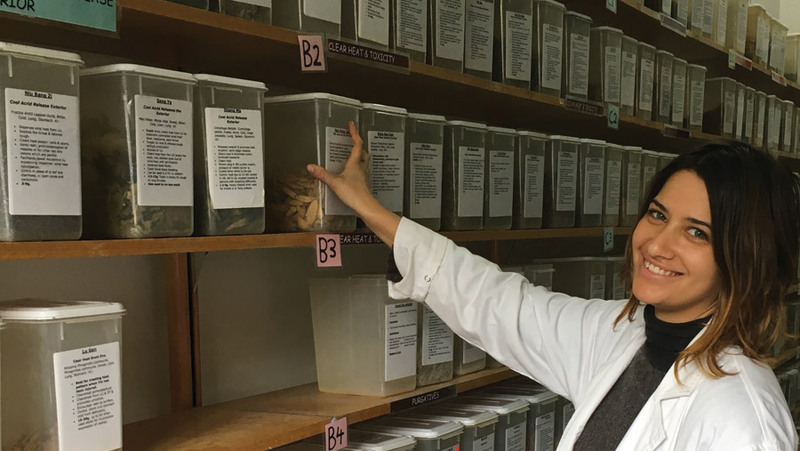 "My favourite part of studying at SSNT are the teachers – we’re really lucky in that every teacher also practices Traditional Chinese Medicine (TCM) so they always have great insights from their own clinical practice. I also love how small our campus is and the community atmosphere that comes from always seeing familiar faces around." This four-year Chinese Medicine degree covers both acupuncture and Chinese herbal medicine and is approved by the National Australian accreditation body TEQSA (Tertiary Education Quality and Standards Agency). With this degree you will gain knowledge about the balance of Yin and Yang and how the disharmony of Qi can result in poor health. Please note: There are no online study options available for the Bachelor of Health Science – Chinese Medicine. Chinese medicine is now a nationally regulated profession. Any practitioner who wishes to advertise and practice as a Chinese medicine practitioner must be registered with the Chinese Medicine Registration Board of Australia (CMBA). Registration is managed through the Australian Health Practitioner Regulation Agency (AHPRA). The primary purpose of registration is to protect the interests of the public. Students are eligible for registration after graduating from an approved course of study. The Bachelor of Health Science (Chinese Medicine) has been granted accreditation by the Tertiary Education Quality and Standards Agency (TEQSA) until the 12th April 2020. This subject introduces the study of Chinese acupuncture and provides practical training in the techniques of acupuncture point location. The general concepts of acupuncture point theory are identified followed by detailed descriptions and locations of all the acupuncture points of the three hand yin channels, three hand yang channels, the three foot yin channels. Basic acupuncture channel theory and pathology is also developed in association with the therapeutic indications of the major points on these channels. This is both a theoretical and practical based subject with a major emphasis on accurate point location as a basis of further acupuncture studies. This subject covers the superficial anatomy of bones, muscles, joints and major neurovascular structures and basic functional anatomy of major joints. The content aims to provide fundamental anatomical knowledge required for Chinese Medicine students to be able to locate acupuncture points on a range of body shapes and sizes. The subject also provides a foundation for musculoskeletal biomedical examination, and diagnosis within the Chinese medicine paradigm. This area of study should provide students with the comprehensive knowledge and skills in the four diagnostic methods inherent in the traditional Chinese diagnostic system. Together these methods which include visual examination, audio- olfactory, enquiry and palpation are sophisticated methods of learning and understanding a patient’s condition. In addition, the Eight parameter (ba gang) system is introduced, and the skills of collecting, organising, analysing, and interpreting the data are examined. For each method of examination, the clinical information sought and clinical significance of this information is analysed in order to diagnose disease including identification of the disease and pattern of disharmony. This subject introduces the fundamental philosophies and principles of Chinese Medicine (CM). It provides a solid and detailed account of the theory of Chinese medicine that can be used as a foundation for the further understanding of later subjects in the CM course. This introduction to Chinese Medicine explores the concept of yin and yang theory, wu xing theory, the functions of the organs and vital substances, as well as the causes, development and progression of diseases. The content also includes the principles of disease prevention and treatment. This first part of this subject introduces Chinese language, with particular reference to the terms used in CM. It provides an overview of Chinese language, specific instruction in the reading, writing and pronunciation of CM terms. The use of the pin yin system of romanisation is examined in order to enable students to accurately spell and pronounce common CM terms. The reading and writing of characters is introduced and students learn to use the main types of dictionaries. The second part of this subject looks at the development of Chinese medicine by way of exploring its historical origins and the process of enculturation which has led to the adaptation of different styles of Chinese medicine both within China and abroad. Underpinning this study will be the major historical figures and medical texts that have affected this evolution. The study of Huang Di Nei Jing (Yellow Emperor’s Internal Classic) covers history, structure and scope of the book. Detailed discussions will be given to the key concepts and statements which significantly affect current CM practice. Anatomy and Physiology 3 (BHS106A) builds and expands on the study of anatomy and physiological concepts introduced in Anatomy and Physiology 1 (BHS101A) & 2 (BHS104A). This subject continues to investigate the structure and function of the human body with special attention given to the interaction between tissues, organs and systems that maintain homeostasis. The structure and function of the digestive, endocrine, urinary and reproductive systems are covered in detail including the homoeostatic control mechanisms of each system and the integration of the systems in the body. This subject is vital in the education of healthcare practitioners to enable them to understand the structure and function of the human body as well as the importance of homeostasis and the ways in which the body maintains balance. This subject provides instruction in the practical application of ancillary techniques to do with the clinical practice of acupuncture. The techniques introduced include Moxibustion (heat), Gua Sha (spooning), Cupping, Lancing, Dermal Hammer and Micro acupuncture. Tongue and pulse diagnosis are reviewed, practised and extended from previous foundation subjects, and students administer the above techniques in a simulated clinical setting under supervision. Infection control, sterilization, hygiene and safety are reinforced throughout this subject. This subject expands and builds on the herbal disciplinary knowledge presented in Pharmacology 1 (CHM202A) and 2 (CHM204A). This subject aims to introduce theory of developing formulae and examines in detail the composition, actions and main therapeutic applications of approximately 120 major formulae. The depth of study may vary depending on the importance of the formulae and their frequency of use. Emphasis is upon the methods of preparation, administration of the herbs, principals of composition, typical modifications, actions, main therapeutic applications and any cautions or contraindications of traditional Chinese herbal formulae. Also included is an in depth study of the comparisons and contrasts relating to formulae within a similar therapeutic category and the function of herbs both singularly and as a synergistic component within the formula. This subject is a continuation of Acupuncture Therapeutics & Techniques 1 (CHM210A). This subject is primarily practical in nature and introduces students to supervised needling practice on selected acupuncture points covering the three foot yang channels, Ren and Du channels, as well as principle non channel points. The logic of acupuncture point selection and combinations, methods of needling and further acupuncture point physiology will be covered in detail. Particular emphasis is placed on safety, hygiene and infection control with students working in pairs so that each student becomes aware of the acupuncture experience from both the practitioner and the client’s perspective. Tongue and pulse diagnosis are also reviewed, practised and extended within this subject. This subject is primarily practical in nature and introduces students to supervised needling practice on selected acupuncture points covering all anatomical segments of the body. The logic of acupuncture point selection and prescriptions, methods of needling and further acupuncture point physiology will be covered. Particular emphasis is placed on safety, hygiene and infection control with students working in pairs so that each student becomes aware of the acupuncture experience from both the practitioner and the client’s perspective. Tongue and pulse diagnosis are also reviewed, practised and extended within this subject. This subject introduces the study of Chinese massage (Tui Na) and provides practical training in the techniques of Tui Na. The functions and therapeutic indications of the major techniques are studied and practised to ensure that skills required for the safe, effective application of Tui Na are developed, alongside an understanding of ethical and medico-legal responsibilities. Tui Na routines for each section of the body are developed so that by the end of this subject, competency is achieved in delivering a full body Tui Na massage. This subject continues the study of traditional Chinese materia medica introduced in CM Pharmacology 1 (CHM202A) and examines the therapeutic effects of the remaining medicinals. The depth of study may vary depending on the importance of the substance and its frequency of use. Note: of the 207 herbs, 157 will be studied in detail in class while the other 50 are less commonly used and require self-directed learning. The scope of the study includes their fundamental tastes, thermal properties, functions, key indications, channel affiliations, normal dosage range, and combinations with other herbs, cautions, contraindications, preparation and administration. For some toxic herbs, their toxicity and prevention of poisoning will be examined. Chinese medicinal substances affected by the Victorian Drugs, Poisons and Controlled Substances Act will be identified. This subject continues the study of Chinese acupuncture by providing practical training in the techniques of acupuncture point location. The general concepts of acupuncture point theory are identified, followed by detailed descriptions and locations of all the acupuncture points of the three foot yang channels, Ren and Du channels, as well as principal non channel points. The functions and therapeutic indications of the major points and their combinations are examined in detail. This is both a theoretical and practical based subject with a major emphasis on accurate point location as a basis of further acupuncture studies. This subject introduces the study of traditional Chinese Herbal Materia Medica. The subject examines the therapeutic application of 206 Chinese medicinal substances. Note; of the 206 herbs, 145 will be studied in detail in class while the other 61 are less commonly used and therefore require self-directed learning. It is essential that students have a working knowledge of these herbs. The scope of the study includes their fundamental tastes, thermal properties, functions, key indications, channel affiliations, normal dosage range, and combination with other herbs, cautions, contraindications, preparation and administration. For some toxic herbs, their toxicity and poisoning prevention will be examined. Chinese medicinal substances affected by the Victorian Drugs, Poisons and Controlled Substances Act will be identified. This subject develops systems of differentiation of syndromes according to the Chinese medicine model as a basis for a more sophisticated method of diagnosis and treatment. The principal symptoms and disease mechanisms associated with the CM diagnostic patterns are studied and differential diagnosis by pattern discrimination is used to identify the appropriate treatment strategies and prescriptions. The Eight Parameter, six exogenous pathogen system and pattern differentiation according to Qi , Blood and Body fluids are revised and examined in conjunction with the primary focus of this subject, that is, Organ pattern differentiation. Finally an introduction to pattern differentiation according to febrile diseases is covered, as a precursor to the more extensive study of this topic in CM Classics. Pathophysiology & Clinical Diagnosis 2 (BHS204A) is a core subject that builds upon the concepts covered in Pathophysiology & Clinical Diagnosis 1 (BHS203A). This subject is comprised of the pathophysiology, symptomatology and clinical physical diagnostics for various disease states of the hematologic, pulmonary, musculoskeletal and integumentary systems. Clinical diagnostic skills for these various body systems are introduced together with laboratory diagnosis and include examination techniques, commonly used laboratory techniques and interpretation of findings. Pathophysiology & Clinical Diagnosis 1 (BHS203A) builds upon the basic pathological principles established in General Pathology (BHS201A) and comprises the pathophysiology, symptomatology and clinical physical diagnostics for various disease states. This subject includes diseases of the gastrointestinal, neurological and cardiovascular systems. Clinical diagnostic skills for these various body systems are introduced together with laboratory diagnosis and include: examination techniques, commonly used laboratory tests and analysis and interpretation of findings. This subject is both a theoretical and practical based subject with a major emphasis on the safe and accurate dispensing and processing of Chinese medicinal substances. This subject provides practical training in the fundamental skills required to safely and accurately dispense and prepare a Chinese herbal prescription according to the main methods of herbal processing (pao zhi). Students will gain additional experience in the dispensing component of this subject via internal and external work integrated learning. It is expected that this placement will be undertaken within the student clinic and at external clinics. The herbal processing component of this subject covers the objectives of herbal processing is to ensure the correct methods of preparation, alongside an understanding of the legal and ethical issues associated with dispensing herbs, with special attention to S1 herbs. This subject covers the study of CM gynaecology and obstetrics. It examines the features of anatomy and physiology of the female reproductive system. This includes the processes of menstruation, pregnancy and birth, as well as gynaecological and obstetric disorders. The aetiology, pathogenesis, differentiation of syndromes, approaches to treatment for each of the main diseases studied will be analysed. For each disease Chinese herbal formulae and/or acupuncture, with suitable modifications for individual cases, along with lifestyle advice will be examined. A short section on male infertility will be included. Students are required to undertake 65 hours of clinical participation. These practica extend the experience of the student in the role of practitioner, enabling them to practice independently, be able to conduct full client consultations (which include performing relevant physical examinations), consolidate case-history information, formulate treatment plans, carrying out acupuncture, moxibustion and cupping treatments, provide appropriate dietary and lifestyle advice and undertake administrative duties. Students are expected to be conversant with and understand all the relevant ethical and legal responsibilities of a practitioner when treating a patient. Feedback regarding progression will be given on a weekly basis. Integrated Pharmacology and CM Phytochemistry (CHM308A) comprises a study of basic principles of pharmacology, the pharmacokinetics of drugs commonly used in medical practice, common interactions between drugs and Chinese medicinal substances and toxicology. Drugs for pain, inflammation, psychological functions, cancer, infection and the cardiovascular, respiratory, gastrointestinal, reproductive and endocrine systems are discussed including actions, uses, contraindications, adverse effects and interactions with Chinese medicinal substances, together with implications for CM prescribing. This subject also addresses the phytochemistry of Chinese herbal medicine including actions, production and function in addition to potential interactions with common western pharmaceuticals. This subject is crucial for the modern CM practitioner to understand common medications that clients may be taking and common interactions between these medications and CM remedies as well as the chemistry and pharmacology of Chinese herbal medicines. It also emphasizes the need for clear lines of communication and common language between doctors and complementary healthcare practitioners in order to obtain the best health outcomes for clients. This subject aims to introduce the theory, CM diagnosis and treatment of common diseases of the eyes, ears, nose, pharynx, larynx, mouth and teeth. For each disease the aetiology, symptomatology, diagnosis, pattern differentiation and treatment strategies will be analysed. The formulation of Chinese herbal prescriptions, acupuncture/moxibustion treatments, together with life-style advice that addresses the main symptom patterns (zheng) are also examined for each disease. Students are required to undertake 65 hours of clinical participation. The subject continues to build foundation skills in the operation of Chinese medicine clinics. Students are required to continue to integrate all of the theoretical and practical studies undertaken throughout the course by demonstrating basic clinical skills in both the student clinic and external clinical settings. Students are expected to be conversant with and appreciate all the relevant ethical and legal responsibilities of a practitioner when treating a patient. Students are expected to be actively engaged in the management of a clinic, interaction with patients, forming a diagnosis and treatment principle, as well as engaging in the acupuncture and ancillary therapeutic processes. This will involve observing preliminary case questioning, diagnosis and performing supervised treatments such as moxibustion, cupping and basic acupuncture needling. Feedback regarding progression will be given on a weekly basis. This subject expands and builds on the herbal disciplinary knowledge presented in CM Pharmacology 1 (CHM202A), CM Pharmacology 2 (CHM204A) and CM Formulae (CHM208A) and is an advanced subject of pharmacology and formulas. This subject includes the in-depth analysis of major formulae with particular focus being given to the comprehensive and advanced combinations within herbal formulae. Emphasis is placed upon the function of herbs both singularly and as a synergistic component within the formula, herbal combination principles, which include the various combinations of tastes and natures, their functions and indications. Students will enhance their skills and knowledge of appropriate herb combination, as well as their analytical abilities to construct formulas. This subject continues the study of CM Internal Medicine (nei ke). This second part of this subject covers some specific blood diseases, disorders of the endocrine system, connective tissue disorders, urinary system disorders and male reproductive disorders. The approach will incorporate an analysis of the above pathologies according to the CM paradigm of differentiation of syndromes (bian zheng) and also incorporate a Western medical classification of disease. For each of these conditions, the aetiology, pathology and formulation of Chinese herbal prescriptions and acupuncture and moxibustion treatments that address the specific requirements of the symptom patterns (zheng) are studied. Lifestyle and safety issues are also addressed. Students are required to undertake 65 hours of clinical participation (5 hours per week for thirteen weeks). This subject serves as an introduction to the operation of CM clinics from the perspective of the student practitioner. Students are required to begin to integrate all of the theoretical and practical studies undertaken throughout the course by demonstrating basic clinical skills in the Wellbeing Clinic including an understanding and appreciation of all the relevant ethical and legal responsibilities of a practitioner when treating a patient. Students are expected to be actively engaged in the management of a clinic, interaction with patients, forming a diagnosis and treatment principle, as well as engaging in the acupuncture and ancillary therapeutic processes. This will involve observing preliminary case questioning, diagnosis and performing supervised treatments such as moxibustion, cupping and basic acupuncture needling. Feedback regarding progression will be given on a weekly basis. This subject is a combination of theory and practical which covers the study of selected traumatology cases, particularly musculoskeletal conditions. The focus is on the differential diagnosis and treatment of regional disorders both from a holistic CM paradigm and a modern bio-mechanical perspective. For each condition a complete acupuncture treatment along with common herbal formulae and lifestyle advice are analysed and studied. Basic physical assessment and selected major orthopaedic tests for each region are also introduced. This subject introduces the study of CM Internal Medicine (nei ke). The subject is comprised of two parts. The first part introduces a number of main diseases of the respiratory, vascular and digestive systems. The second part (CM Internal Medicine 2 – CHM304A) introduces some specific blood diseases, disorders of the endocrine system, connective tissue disorders, urinary system disorders and male reproductive disorders. The approach will incorporate an analysis of the above pathologies according to the CM paradigm of differentiation of syndromes (bian zheng) and also incorporate a Western medical classification of disease. For each of these conditions, the aetiology, pathology and formulation of Chinese herbal prescriptions and acupuncture and moxibustion treatments that address the specific requirements of the symptom patterns (zheng) are studied. Lifestyle and safety issues are also addressed. Pathophysiology & Clinical Diagnosis 3 (BHS301A) is a core subject that builds upon basic concepts covered in Pathophysiology & Clinical Diagnosis 2 (BHS204A). This subject comprises the pathophysiology, symptomatology and clinical physical diagnostics for various disease states of gerontology and aging and the endocrine, renal, urological and reproductive systems. Clinical diagnostic skills for these various body systems are introduced together with laboratory diagnosis and include examination techniques, commonly used laboratory techniques and interpretation of findings. This subject is conducted concurrently with CM Clinical Practicum 6 (CHM410A) and includes information and skills important to clinic operation and the role of student practitioners in the Student Clinic. Critical analysis and review of case studies from the student clinic are reviewed each week by way of student presentations incorporating relevant journal articles from both the Chinese medicine (CM) and contemporary western scientific (WSM) medical literature. A major focus of these clinical forums incorporates an integrated (CM/WSM) approach to the understanding and practice of clinical practice. These sessions are conducted to enable issues of particular importance to students to be addressed and to facilitate their personal development. This development plays an integral part in the transition from student to practitioner as the participants learn to integrate theoretical knowledge with practical clinical experience. The supervisor moderates an exchange of ideas, experiences and concerns, which are facilitated through group presentations, open discussion, peer review and group support. Students are required to undertake 130 hours of clinical participation. This practicum provides the final year student with experience in the role of practitioner. Under the supervision and continuous monitoring of qualified Chinese medicine practitioners, student practitioners conduct full client consultations. This component synthesises the full range of theoretical and practical studies undertaken throughout the course. Students are expected to demonstrate appropriate ethical behaviour when dealing with patients and to take responsibility for all legal requirements inherent in the patient practitioner relationship. Feedback regarding progression will be given on a weekly basis. On completion of this subject, students will be able to competently manage a full patient consultation and treatment, and will have acquired the skills necessary for membership of professional associations and the Chinese Medicine Registration Board. An exit examination, comprising both acupuncture and herbal medicine treatments, must be completed by each student for successful completion of this subject. The subject aims to introduce learners to the study of Chinese medicine dermatology. It covers the general features of physiology, pathology and diagnosis as applied to dermatology, as well as the diagnosis and treatment of the common dermatological diseases. For each of the diseases, learners learn to formulate the prescriptions of internal and external used Chinese herbal formulae and/or select points for acupuncture and/or moxibustion. In addition, students learn to advise clients with regard to lifestyle and prevention issues. All disorders studied in this subject are introduced as pathologies from the contemporary Western diagnostic paradigm and then transposed into the Chinese medicine paradigm of differentiation of syndromes (bian zheng) for further discussion. This subject will expand on some of the basic metaphysical principles covered in earlier subjects as well as specific shen (spirit) related disorders according to Chinese medicine theory and practice. The basic Chinese medicine premise of mind and body interdependence will be expanded as it relates to spiritual resources, emotions, personality and behaviour. The framework of this discussion will be focussed on Chinese medicine five element theories as well as zang-fu, qi and blood physiology, and jing luo (meridians). This subject then expands on these preliminary concepts through a selection of mental illnesses as diagnosed by the contemporary western approach, applying Chinese medicine symptomatology, aetiology and pathogenesis. Differentiation of syndromes (bian zheng) is applied to formulate a Chinese medicine diagnosis and treatment plan, using both acupuncture and Chinese herbs. This subject provides instruction in the Chinese medicine approach to health enhancement. The focus is on maintaining and enhancing health through lifestyle, cultivation of the mind, physical exercise and diet. The principles of physical and mental health are examined through practical training in aspects of medical Qi Gong. Students are required to undertake 130 hours of clinical participation This practicum provides the final year student with experience in the role of practitioner. Under the supervision and continuous monitoring of qualified Chinese medicine practitioners, student practitioners conduct full client consultations, which include performing relevant physical examinations, consolidating case-history information, formulating treatment plans, formulating Chinese herbal prescriptions, preparing and dispensing formulae, carrying out acupuncture, moxibustion and cupping treatments, providing appropriate dietary and lifestyle advice, and performing administrative duties. This component continues the synthesis of the full range of theoretical and practical studies undertaken throughout the course. Students are expected to demonstrate appropriate ethical behaviour when dealing with patients and to take responsibility for all legal requirements inherent in the patient practitioner relationship. Feedback regarding progression will be given on a sessional basis. This subject is designed to facilitate the exploration of the origin and historical development of the Wen Bing theories including the diagnosis and treatment of febrile diseases and how these relate to the Shan Han Lun. The focus is upon the characteristics 4 phases (wei, qi, ying, xue) and san jiao classifications of febrile disease and includes analysing the diagnosis and treatment methods used in managing Wen Bing diseases. Particular emphasis is directed towards understanding and analysing the aetiology, symptomatology and symptom differentiation as well as the clinical application of the representative formulae and associated modifications. Professional Ethical Practice (BHS401A) comprises the basic skills needed for the operation and management of a complementary healthcare practice and provides an understanding of the legal and ethical requirements that are pertinent to the complementary healthcare practitioner. This subject explores business strategies including operating policy and procedures, marketing and networking strategies, leadership duties and administrative and financial issues. Also included in this subject is ethical conduct, liability, legal and regulatory topics. Students are required to undertake 130 hours of clinical participation. This practicum extends the experience of the student in the role of practitioner, enabling them to practice independently and conduct full client consultations, which include performing relevant physical examinations, consolidating case-history information, formulating treatment plans, formulating Chinese herbal prescriptions, preparing and dispensing formulae, carrying out acupuncture, moxibustion and cupping treatments, providing appropriate dietary and lifestyle advice and undertaking administrative duties. Students are expected to demonstrate appropriate ethical behaviour when dealing with patients and to take responsibility for all legal requirements inherent in the patient practitioner relationship. This component synthesises the full range of theoretical and practical studies undertaken throughout the course. Feedback regarding progression will be given on a weekly basis. This subject is designed to facilitate the exploration of the origin, historical development and clinical significance of the Shan Han Lun theory including the diagnosis of febrile diseases, the progression of disease via the six divisions and the associated symptomatology, pathogenesis, treatment principles and strategies. Particular emphasis in this subject is directed towards the relationship between the six channels and eight guiding principles and zang fu in order to understand and analyse the clinical application of the representative formulae and associated modifications according to syndrome differentiation. This subject introduces advanced acupuncture needling techniques. Acupuncture skills learned in previous subjects are synthesised, and focus is placed upon the safe and effective needling of high risk acupuncture points. Students are required to develop a greater knowledge of, and increased proficiency in, different needling techniques and styles. Advanced electro-acupuncture methods are taught, with an emphasis on the use of electro-acupuncture in acupuncture analgesia. Laser acupuncture theory and practice is also introduced.